Darkfall Cave is a cave located just southwest of the Orc stronghold Mor Khazgur. This cave system is extremely dark, so be sure to bring some source of light if you don't have a form of night vision. The entrance to the cave is at the end of a mountain meadow, which rises to just above the snowline. A few paces northeast of the entrance is a snowberry bush. 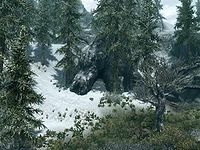 There are a number of random encounters nearby including leveled animals and Forsworn. Entering leads into a natural cave with a sparsely lit passage descending to the south. There are a couple patches of white cap fungus growing in this passage. At the bottom the passage turns west and passes a pool that is fed by a waterfall. There is a ledge overlooking the pool above the water level, on the south wall. Following the path around the pool and it takes a couple of turns before passing the ledge. There is a white cap fungus on the left. The passage turns south at this point. Ahead, on the left is a large rock with a frostbite spider in an alcove just behind it. Thick cobwebs cover the front, that you need to hack or burn. There appears to be a concealed door at the back of the alcove, but no way to open it on this side. On the ground is a dessicated corpse and an egg sac, both can be looted or harvested respectively. The path turns west just by the rock and continues to descend. You pass a patch of fly amanita on your right, before reaching a narrow suspension bridge over a fast moving underground river. The bridge creaks and quivers as you cross and is obviously in poor condition with one of the rope handrails missing. On the far side is a small ledge with two moonstone ore veins; one on the ground and one on the wall. There is also a small round wooden table off to the right, with a pickaxe on top. Once you have crossed, attempting to cross back again, will result in the bridge collapsing and dropping you into the river below. You will be swept rapidly downstream. The only way to reach the far side, without having to work your way through the entire cave system is to use Whirlwind Sprint dragon shout. This will enable you to mine the ore veins and then leave. While allowing yourself to be swept away by the fast moving water, you will be forced underwater several times during the ride, but never long enough to put you in danger of drowning. Stay above water, you will see several glowing mushrooms and a couple of frostbite spiders. Eventually, you will drop over one last short waterfall and be deposited onto a wide rocky stream bed. Here first two frostbite spiders, and then three more will converge and attack. On a pillar in front are several more glowing mushrooms. Heading downstream, you will see raised banks on either side. On the right-hand side are two more egg sac that you can harvest and just past these is a large perfectly circular hole in the wall with thick cobwebs blocking it. A giant frostbite spider is behind this webbing. Once you have dealt with the spider, at the back of the hole is an unlocked chest and a skeleton you can loot. There are a few web sacs on the ground which can be looted and several more glowing mushrooms on the walls. The stream passes under the cave wall and the path turns west, before turning north again by a lit brazier, it also narrows and starts to climb. At the top you can see an extinguished campfire ahead and on the right the body of a dead Breton woman with a lit torch beside her. On the corpse is a note which explains a little about why she was here. The camp has been set up at a crossroads, your approach is from the south. There is an unlocked wooden chest containing loot, including three more torches, an unowned bed roll and a small table beside the fire. On the table are two random potions of resist fire, a cure poison potion, a satchel, a steel dagger, three spider eggs and a medium coin purse. To the left of the table, on the east wall is a concealed door, which acts as a short-cut to a large chamber deeper within the cave system. There is a lean-to and another bed roll to the north. Behind the lean-to is a chain which operates the concealed door. There are passages to the east and west, the latter of these ascends and after a couple of turns enters a chamber with a zigzagging path leading up. There are a total of three bleeding crown and a white cap fungi as well as several hanging moss growing in this chamber. At the top the passage ends at a dead ends with a chain to the left. This lifts the concealed door previously seen by the first spider encountered. Following the path to the east as it descends, you will see it is soaked with blood and part way down there is a tripwire that triggers a rockfall from behind you near the top of this passage. Continue following it and after several turns you will pass three glowing mushrooms on the left and then two more on the right, before it opens out into a large chamber with several pillars of rock, various ledges and in front a large ankle-deep pool of water. There are two trolls wandering along near the northern wall and in the northeastern corner is an unlocked chest, with gory human remains and a lit torch on the ground beside it. There are a few glowing mushroom around the chamber and many hanging moss growing from the ceiling, but little of interest. To the south is a passage, which is where you arrive if you take the short-cut from the camp. There are several broken stone pillars and what appears to be the roof of a building, but with architecture far advanced of any found in Skyrim. Prior to beginning the Touching the Sky quest, there are two more trolls residing at the western end of this chamber. After killing them you can exit the cave by returning to the crossroads and following the passage west. If you have started the quest however, the trolls to the west are replaced by Knight-Paladin Gelebor, and his crude camp. He is an armored snow elf, who can be found wandering his camp. The camp consists of an unowned bedroll, a lean-to covering a rough sideboard and small table holding clutter, and a Shrine of Auriel. As you approach Gelebor will address you. After a short discussion, he will raise a six-sided structure with an empty basin in the middle and give you the initiate's ewer. The wall opposite the doorway is a dark shimmering portal that transports you directly to the beginning of Darkfall Passage. The shrine to Auriel grants a fortify markman blessing. This page was last modified on 11 June 2017, at 07:58.